Our home for seven days. In my previous post, A Travel Tale and a Visit with Grandma, I recounted the hiccups and frustrations of my travel plans as I made my way to California to visit my Grandma. I also alluded to the fact that my travel adventures weren’t over yet. Here’s the rest of the story. Returning to Long Island on Wednesday evening, I had less than forty-eight hours before I, and the rest of the family, boarded a plane headed to Florida so that we could leave on a seven-day cruise to the Eastern Caribbean, which departed on Saturday. 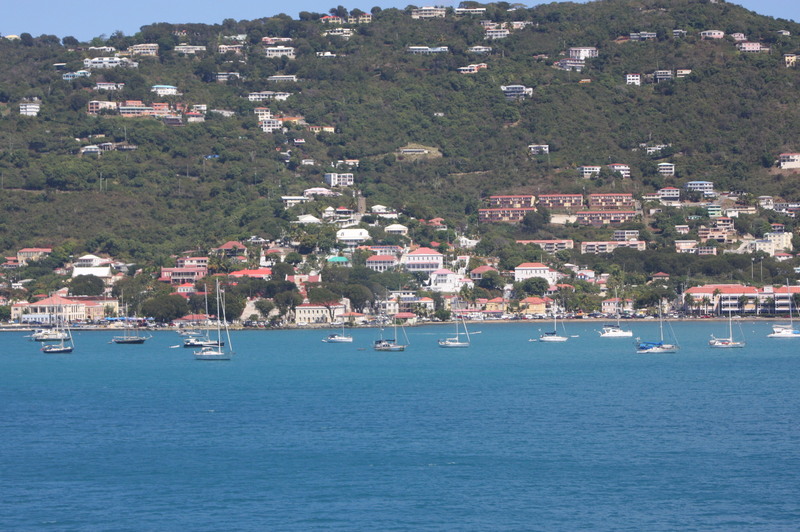 Yes, we were headed on a cruise, with ports of call in the Bahamas, St. Thomas, and St. Martins. I could hardly wait to be in warm weather and to leave the snow and ice of New York behind. Certainly the warmer temperatures in California whetted my appetite for what was to come. This trip came as a result of the realization that our family only had two more years with Jacob at home before he left for college. I wanted to make sure that we planned at least one (and hopefully two) significant trips before this happened. As much as I laugh at the irony of the school’s Spring Break occurring in February, it is a great time to travel. Prices are better and crowds are smaller. We landed fairly quickly on the idea of a beach vacation—Mexico or some other Caribbean destination. For months, every Groupon Getaway deal that landed in my inbox, I explored. Around Christmas, Brad and I wavered. Could we pull off this trip financially? We tightened our financial belts. No more going out to eat every week. (See Use What You Have for more on this topic.) I picked up some tutoring side jobs. In January, on a whim, Brad started looking at cruises. Suddenly, it looked like we might have a trip that all of us would enjoy. Which brings me back to Friday morning. Nowadays, most airlines, when you book a ticket, allow you to receive text messages or phone calls alerting you of your flight’s status. That morning as Brad and I woke up, our first text arrived from Southwest telling us that our flight was delayed thirty minutes. No worries! We had already taken this into account when we booked our tickets. Our cruise didn’t leave until Saturday at 4 pm. We didn’t have the pressure to arrive in Florida at a specific time on Friday evening. We went about our packing and to-do lists, relaxed and unhurried. More texts arrived. The flight was back on schedule. Then, the flight would leave at 8:30 pm rather than 5:30 pm. Back and forth it went until—the final, dreaded text at 12:30 pm. Flight 528 (I don’t know the actual flight number) was cancelled. CANCELLED!! I was in the bedroom when this text arrived and I could tell by the way Brad called me into his office that something was wrong. He showed me the text. Immediately, I felt my mouth go dry and a pit form in my stomach. Brad had already done a preliminary search and there were no other Southwest flights available ANYWHERE ON THE EASTERN SEABOARD that would get us to Florida in time to catch our ship. They were all booked. No driving to Newark, or Philly, or Baltimore, or D.C. to catch a flight. Rain and fog had descended upon the New York area and all the airports were experiencing delays. A search for flights leaving LaGuardia and JFK showed a limited number of flights, to the tune of $2,000 for all four of us to fly one-way, and no guarantees that the flights would actually leave. What about a rental car? No rental car agency wanted to do a one-way rental. The clock was ticking. It was now close to 1:30 pm. We needed to make a decision. Brad and I have driven through the night on a couple of occasions. Once when the kids were little we drove from Chicago to Montana for a family reunion. It was brutal. While the nighttime hours were quiet as the kids slept, they both woke up at 5 am just as Brad and I were feeling the effects of a night without much sleep. We made it, but I felt like I had been hit by a truck. Another time we drove from Waco to Indiana to visit family. We faired a little better since the kids were older. This time was probably the easiest in terms of dealing with the kids. Teenagers sleep a lot and they can sleep most anywhere. The challenge now was for Brad and me to push through. We had to make it to Port Canaveral. I drove the 1:30-5:00 am shift. Coffee and a king-sized Snickers bar did the trick for me. Around 6 am we stopped at a rest area and both Brad and I slept for an hour. Then back on the road for the final push. We arrived around 11:30 am. We parked our car at a hotel that ran a shuttle service to the port and allowed you to leave your car for the week. Anna and I found ourselves in the ladies bathroom changing out of long-sleeved shirts and jeans to shorts and tee shirts. We doused ourselves with deodorant and hoped no one looked too closely at the mascara under our eyes and our stringy hair. With two hours to spare, we boarded the ship at 2 pm. Somehow we made it to 8 pm that night before we crashed. One of the perks of the cruise I enjoyed the most was the free room service. That night we ordered room service and celebrated our safe arrival. We had a whole week in front of us to enjoy cruisin’, as they say. Gratefully, the cruise was uneventful—in the best possible sense. 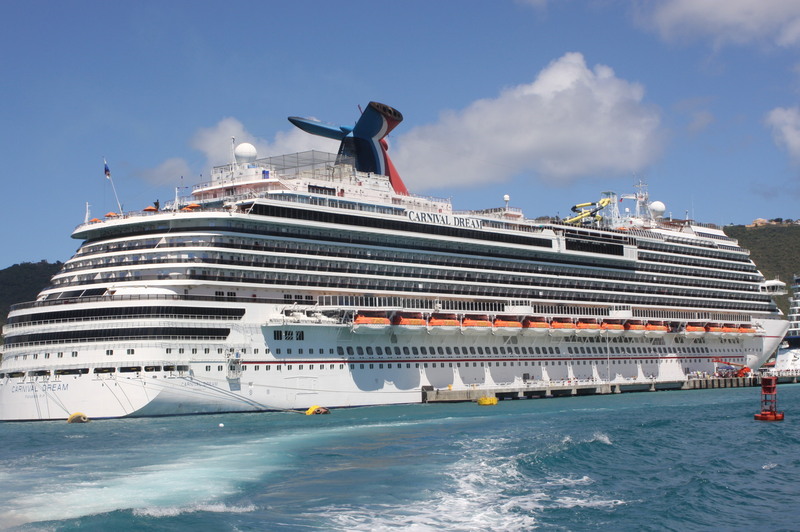 We enjoyed the beauty of the Caribbean islands and participated in cruise activities when we felt like it. We also tried to push to the far recesses of our minds the fact that we would need to drive home at the end of the week. Our return trip was straightforward—long, tiring, but no surprises. We were in the car and driving before 9:30 am the following Saturday. We hoped to make it all the way home, even if it meant arriving at 1 am. But at 11 pm that night and on the outskirts of Baltimore, we decided to call it quits for the day. The final leg of the journey would happen on Sunday. 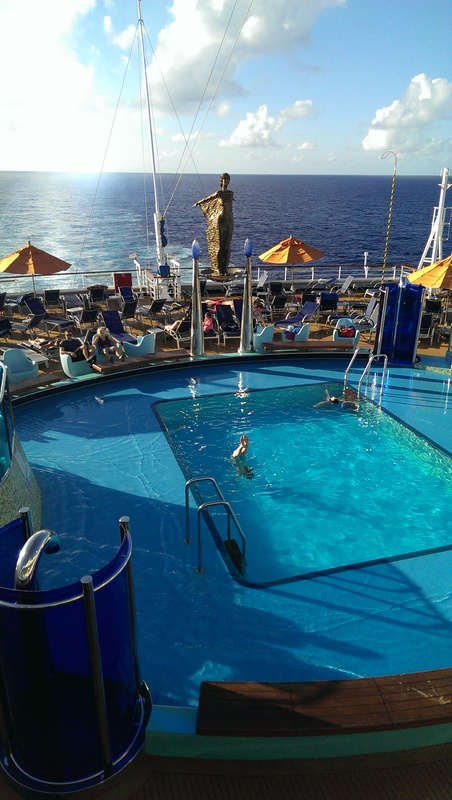 One of the pools aboard the ship.